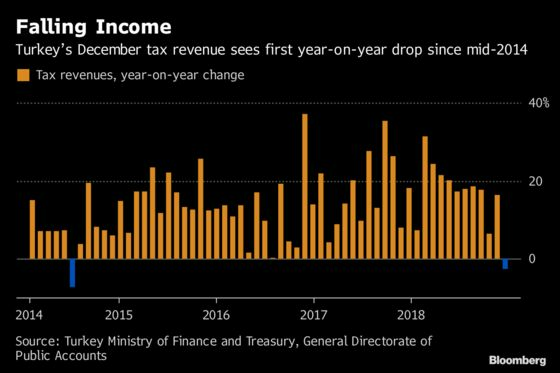 (Bloomberg) -- A fiscal splurge amid back-to-back elections and tax cuts designed to ease runaway inflation are taking their toll on the Turkish government’s finances. The central government ran a budget deficit of 18.1 billion liras ($3.32 billion) in December, the Treasury and Finance Ministry said on Tuesday. That takes the annual deficit to 72.6 billion liras, or around 2 percent of gross domestic product, according to Bloomberg calculations based on most recent GDP data. The annual budget deficit was largely in line with the government’s 72.1 billion liras target. Still, it highlights the negative impact that tax cuts announced in October on products ranging from furniture to white goods to cars have had on the budget. Government bodies tend to spend more in December in order to rundown their allowance, adding extra pressure on finances. Receipts from special consumption tax dropped 11.4 percent in December, due to a ceiling imposed on the price of refined oil products earlier in the year. The deficit excluding interest payments was 16 billion liras in December, down nearly 20 percent from a year earlier. The government posted an ex-interest surplus of 1.3 billion liras in 2018. For more on tax cuts and their market impact, click here.